Beef Noodle Skillet Dinner is a perfect busy day meal. A balanced meal made all in one skillet (even on a campfire) or your instant pot for easy clean up. Dinner is served in under an hour! This recipe is an OLD family favorite. It has a bit of campfire cooking going on in it. This easy skillet dinner you actually could make while camping! It puts me in mind of wagon trains and old cook stoves. Very filling and versatile! Just a Note: This is a reposted recipe. It’s an old favorite I have had on the blog for years. It needed a redo and so here you go. Complete with instructions for the original skillet version and Instant Pot instructions too! Enjoy! I have made Beef Noodle Skillet Dinner countless times over the last three decades. Every time it’s easy, delicious, crowd pleasing and kid approved! This quick recipe needs nothing else for a complete dinner; it’s all in the skillet! Put the leftovers in the fridge for a great re-heated lunch. Clean up is fast and then you can spend the evening enjoying the family. Want this recipe even easier? Make it in your [easyazon_link identifier=”B00FLYWNYQ” locale=”US” tag=”homefoodjunk-20″]Instant pot[/easyazon_link]! I include instructions for the instant pot below. Wow it’s so easy! Lately, Dave and I have not been able to eat as fast as I am cooking. There are only the two of us to feed now. All of our kids are launched into adult life on their own. Our house is much quieter recently. Now I have time to putter about in the kitchen and make homemade Irish Oat bread, and other delicious tidbits. We are getting used to the empty nest and eating quite well. 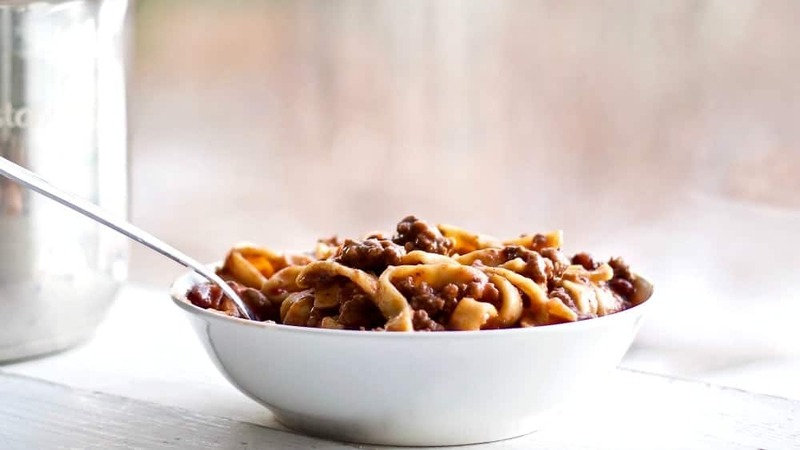 Beef Noodle Skillet Dinner is perfect for a lazy or busy day. For just Dave and I this is at least two or three nights of good eating. The leftovers are terrific! This is a throw it in the skillet and turn it on low for a half hour, meal. I recommend a [easyazon_link identifier=”B000EM9PTQ” locale=”US” tag=”homefoodjunk-20″]deep large skillet with a lid[/easyazon_link] like this one. The non stick and dishwasher safe features would make this recipe even easier! I’ve called it an hour meal due to the veggie chopping time. I’m using fresh onions, garlic and peppers from our garden tonight. I did not include veggies in the recipe. It stands alone quite well in you don’t mind making a salad on the side like KALE APPLE SALAD WITH HONEY DRESSING. If you make it without any extras it’s ready in about 45 minutes. Beef Noodle Skillet Dinner will hold over well and make great leftovers! My husband ate this meal for three days straight and never complained! He’s used to eating leftover but this is one of his favorite leftover meals. The noodles just get more flavorful as they soak up the sauce. The finished noodles should be slightly saucy, never dry, but not dripping. Here it is in a skillet. The non negotiable part of this recipe is the Beef (this is a hamburger meal), tomatoes (I’ve always used canned, diced or stewed), tomato sauce, ketchup and kidney beans, undrained. Oh, and the Worcestershire Sauce! There is no replacing the unique flavor it adds. And of course, you need some noodles. Elbow, spirals and other types of noodles will work. They will soak up the sauce just fine. But for the pretty look I love the veggie bow ties. They add so much color pop and the ruffled bows are cute! they also are very easy to eat and taste scrumptious all cooked in that flavorful sauce. I’m using veggie bow tie noodles in this skillet version. I love these cute pops of color and they are easy to eat and soak up the sauce perfectly! If you make this recipe in a skillet check it sometimes to make sure the noodles don’t burn to the skillet. Because any noodle will work you have to figure out the exact amount of water you need for this recipe on the fly. I have the recipe set for the bow tie noodles I’m using. The recipe is dependable but you should stir it once in awhile just to be sure. Skillet Noodles can be tricky. If you go your own way on the noodles, the proportions will need to be adjusted for the sauce. All noodles are different. Also if you’re using canned or frozen veggies, you may need a few more noodles,(OR drain the cans). So I encourage you to use this recipe as it is written the first time. Then branch out on your own and use whatever you like. But if you start changing those proportions or use different noodles or cans….beware the results. I’ve added these process pictures for just this reason. So you can see how much sauce to how many noodles. Once the sauces are in, pour the noodles on top and stir them in. make sure you have enough sauce to cook the noodles, add water if necessary! This is an easy crowd pleasing filling meal your family will love. I have made it forever and that is why I’m telling you to check it occasionally. Otherwise this is a trouble free recipe, made all in one skillet from browning the meat to serving it up. Enjoy! FYI: This is a totally separate (although similar) recipe from my Instant Pot Meaty Italian Pasta Dinner. They have completely different flavor profiles. If you want an all in a minute Italian type meal hop on over and check out the other guy. This one is pure cowboy. Enjoy! Making this recipe in an instant pot is even simpler than making it in a skillet! Brown the hamburger, throw all the other ingredients into the instant pot and pressure cook five minutes. Done! 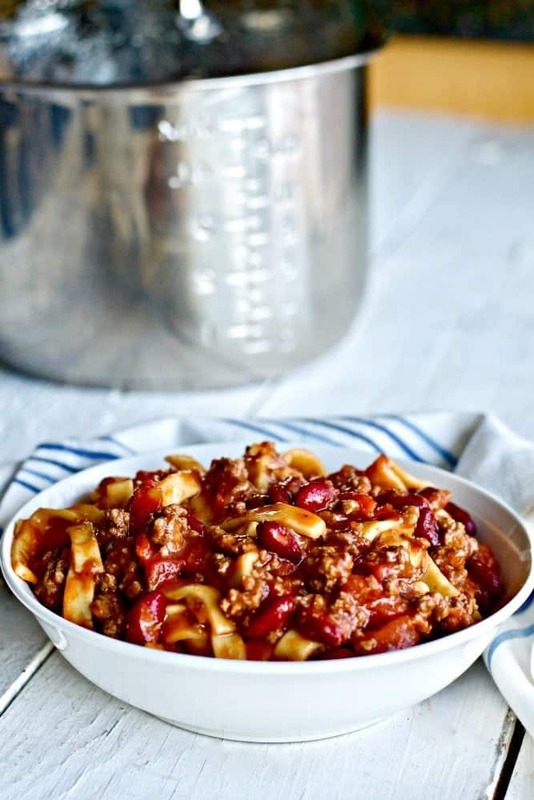 I made this recipe in my [easyazon_link identifier=”B00FLYWNYQ” locale=”US” tag=”homefoodjunk-20″] instant pot [/easyazon_link]and it turned out fantastic with hardly any work. I LOVE my instant pot and use it for all sorts of things. If you have one you know how cool these amazing machines are. If you haven’t heard of them click the affiliate link to learn all about my new best kitchen friend! Go here for more instant pot recipes! I used these Egg Noodles for the instant pot version of Beef Noodle Dinner. found them at Costco. NOTE: I used egg noodles for the instant pot. Durum Semolina noodles are pretty dense. They came out just right. If you are using really thin or delicate noodles they may overcook. Experiment with your favorites. Set the instant pot on saute, cover it with a vented lid ([easyazon_link identifier=”B008FUJ2LK” locale=”US” tag=”homefoodjunk-20″]I use this one[/easyazon_link]) and brown the hamburger until thoroughly cooked. When the pot beeps open the lid quick release and check the noodles. They should be perfect but if not cover the pot with the VENTED lid and set the pot to saute until you like the noodle doneness. Beef Noodle Skillet Dinner made in my instant pot. So yummy! Whatever vegetables you wish to add. Just adjust the cooking time if adding hard root veggies. Brown hamburger in a large skillet, Mincing the hamburger with the spatula as it cooks (don't wait until it's cooked or it will get hard). Add in the onions and garlic, peppers and cook until the onion is translucent. Add in the tomatoes,Worcestershire Sauce and tomato sauce and rinse the cans and pour at least half of the rinse water into the skillet. Add the kidney beans and ketchup and mix well. This should be a saucy consistency. add the noodles, stir until the noodles are immersed in the sauce. Cover and cook on low until the noodles are cooked; about a half hour. Occasionally, stir the skillet to make sure there is enough sauce to cook the noodles and not burn. Add water as needed. Set the instant pot on saute and brown the hamburger until thoroughly cooked. When the pot beeps open the lid quick release and check the noodles. The noodles should be perfect but if not cover the pot with a VENTED lid and set the pot to saute' until you like the noodle doneness. I am getting an instant pot this week and would like to try this. I heard that you use LESS liquid for pressure cooking than stove top cooking because no liquid is lost? I notice the recipe is same for both? Also question about rinse water — there are 3 cans — do we use half of each of the three cans = 21 oz water? Yay! I know you will love your instant pot. This is a very easy first Instant pot recipe to try and a reliable family favorite of ours. The instant pot DOES require less liquid than other methods of cooking. HOWEVER, I chose to leave the liquid alone since I’m not sure which noodles you will choose. This recipe works with any pasta but the denser pasta (Like the seminola I chose) will perform better with the stated amount of water. I don’t want you to underdo the water and wind up with a sticky burned to the bottom of the pan result. 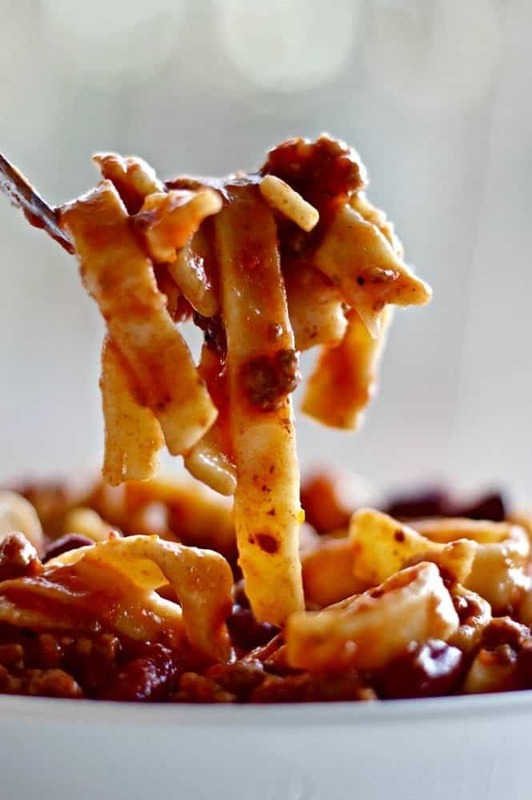 Pasta will continue to absorb liquid so leftovers will such up any extra liquid. Feel free to adjust the water from rinsing the cans as you prefer. I put a picture in the post to help you know how saucy it should look before cooking. I used bow noodles that time. Let me know how it turns out. Our readers and I love the feedback. It’s so helpful. Enjoy! Such a great dinner recipe, super easy and delicious! And the sauce…looks so good! This looks so warm and comforting!! I would eat the entire boy myself!! Perfect for fall! Absolutely Dixya. One of my favorite easy clean up dinners! Great flavors and so simple to put together; our kids will love this one! I bet they will Dan! It’s a kid pleaser for sure! 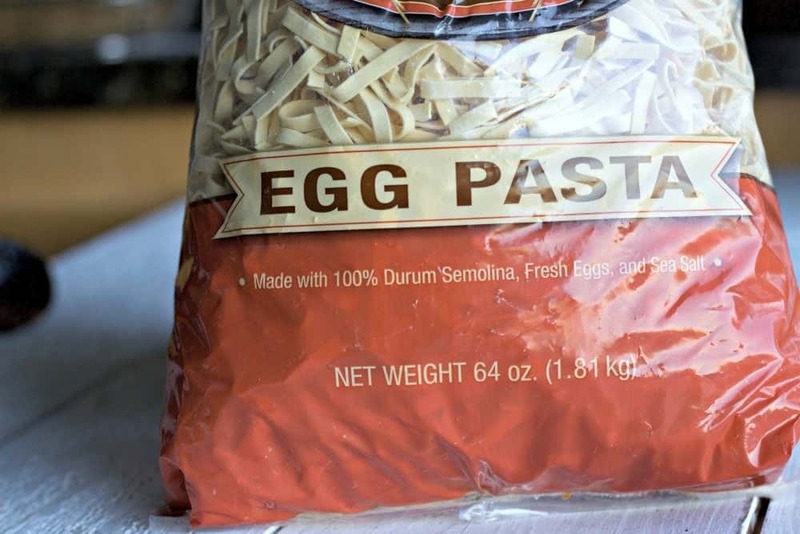 What a fun pasta recipe. 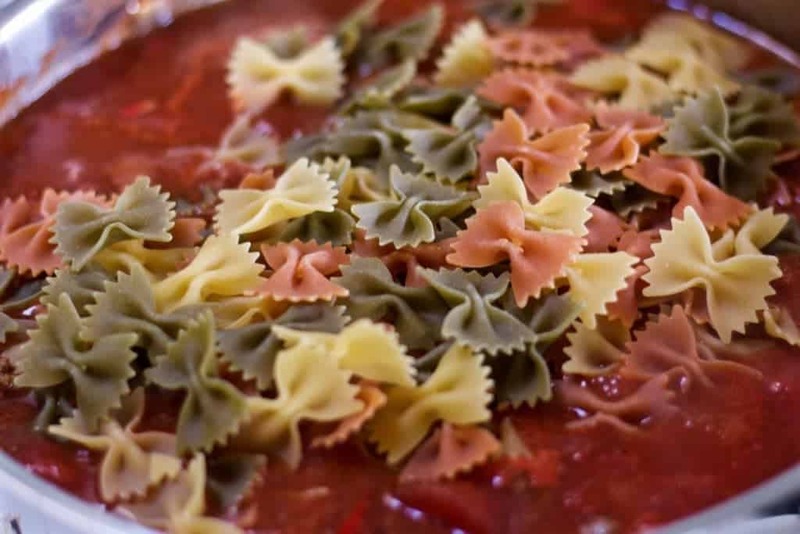 I loved the use of bow tie pasta. My little one would love it. Thank you Deepika! I believe this would be a winner dinner for you! I love one pan meals, this sounds delicious, perfect for a cozy fall dinner! It truly is Joy, Thanks so much! I love these crowd pleasing recipes. I just made a skillet ravioli lasagna and it was such a hit and so easy for me. Looks delicious! This is a delicious easy one skillet dinner. Thank you Florentina! I love a one pot magic pasta! Lovely dish and perfect for this time of year. Thank you Helen, It’s one of our favorites! Such a great one pot, weeknight meal! Looks so hearty, and like it will fill hungry bellies! It definitely will fill up a hungry family’s bellies Rachel, and put smiles on their faces! I’m sure your family wuold love this meal Paige. It’s tried and true. Our grandkids all love it too! Easy, crowd pleasing meals like this are so handy to have in the recipe box! This looks absolutely amazing! I love that you used so many fresh ingredients from your garden. My boyfriend would LOVE this. Pinning for later! Thank you Whitney. I’m sure he will enjoy Beef noodle skillet dinner! I think you’ll love this dish Leslie. It’s tried and true! Totally loving this delicious one pot meal! I’ve pinned & tweeted to pass the word. Thanks for stopping by and sharing with us at #TryaBiteTuesday – can’t wait to see what you have for this week, YUM!!! This looks so delicious! We’re always looking for a quick meal and this seams perfect! Hi Jacqui, This is a perfect choice for a quick skillet dinner! Stop by anytime Tina, I’ll be sure to make this for you! In fact, I’ll make lots of stuff. When you get here we can play in the kitchen and have a blast!So wishing we were closer! This sauce was amazing – super easy and super delicious! Thank you for taking the time to write in and tell us your experience with Beef noodle skillet dinner, Sarah! I’m thrilled you enjoyed this simple, crowd pleasing meal! It’s a family favorite! This looks like a wonderful meal — nutritious and tasty. Thank you for sharing. Thank you for stopping by, Marisa! We love this recipe! I hope you enjoy this easy, delicious meal, Dixya!